Beth Levin's artistry invokes an uncanny sense of hearing for the first time works long thought familiar, as though the pianist herself were discovering a piece in the playing of it. Such a style of refreshment and renewal can be traced back to Levin's unique artistic lineage. As a child prodigy, she made her debut with the Philadelphia Orchestra at age 12. She was subsequently taught and guided by legendary pianists such as Rudolf Serkin, Leonard Shure, Dorothy Taubman and Paul Badura-Skoda, who praised her as "a pianist of rare qualities and the highest professional caliber". 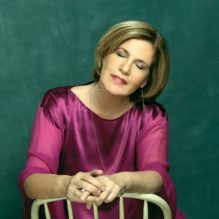 Her deep well of experience allows Levin to reach back through the golden age of the Romantic composers and connect to the sources of the great pianistic traditions, to Bach, to Mozart, to Beethoven. Levin has appeared as a concerto soloist with numerous symphony orchestras, including the Philadelphia Orchestra, the Boston Pops Orchestra, the Boston Civic Symphony and the Seattle Symphony Orchestra. She has worked with noted conductors such as Arthur Fiedler, Tonu Kalam, Milton Katims, Joseph Silverstein and Benjamin Zander. Chamber music festival collaborations have brought her to the Marlboro Festival, Casals Festival, Harvard, the Edinburgh Fringe Festival, the Ankara Music Festival and the Blue Hill Festival, collaborating with such groups such as the Gramercy Trio (founding member), the Audubon Quartet, the Vermeer Quartet and the Trio Borealis, with which she has toured extensively. Among Levin's recordings are live performances of Bach's Goldberg Variations and Beethoven's Diabelli Variations. Her interpretation of the Diabelli Variations has been described as "consistently fascinating" (Steve Smith, NY Times) and simply "stunning" (Robert Levine, Stereophile Magazine). Of Levin's Goldberg Variations, Peter Burwasser of Fanfare Magazine stated that she plays "as if she is in love with the notes....with always the sense that she is exploring Bach's genius." Her performances have been broadcast on National Public Radio, WGBH (Boston), WFMT (Chicago) and WNYC, WNYE and WQXR (New York). For all her devotion to the Romantic canon, Beth Levin remains committed to the performance of the music of our time, interpreting composers such as Henryk Gorecki, Scott Wheeler, Mohammed Farouz and Michael Rose, among many others. Her closest collaborators have been the composers David Del Tredici and Andrew Rudin, both of whom have written works for her.